Use this screen whenever you receive any payment through cash or check. This will help you to maintain accurate details for all the payments which you have received against sales. Customer Name : Please enter or select customer name ( Type *. * to search from the list of customer records) who is paying this amount. Branch Name : If you are a multi branch company and maintain separate payment details for each branch, then please select your branch. For single branch company, your company name will be hard coded on this field and you do not have to select anything. Please click on SUBMIT to display the outstanding invoices for this customer to apply the payment against correct invoice or invoices. Received Mode : Please select the mode of payment. If your customer has paid you through cash, then please select CASH, for check payment please select the Bank name ( HDFC, CITI Bank etc) where you have deposited this check. Amount : Enter the total received amount. 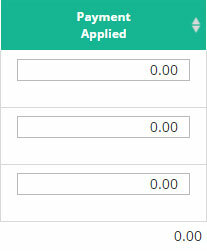 Unapplied Amount : Unapplied amount will indicate that you have received more amount than you applied on this screen. That means you can tag more invoices to apply remaining balance. 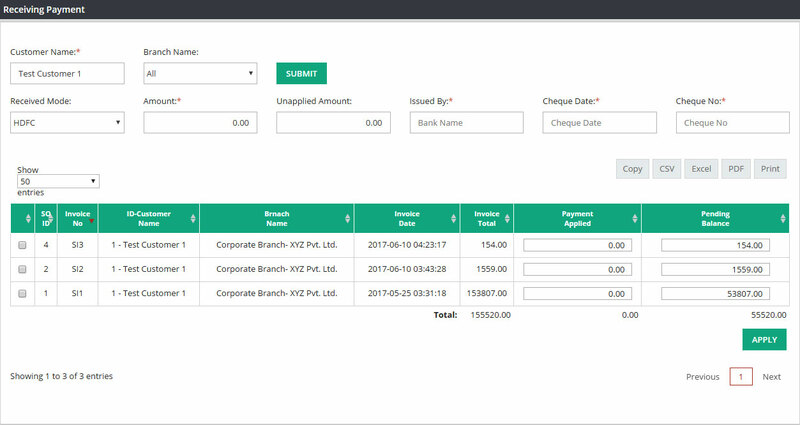 For an example your customer has paid you 500, you have entered 500 in Amount field and you have tagged invoice for 400 from list of outstanding invoices. On this scenario 100 will appear as unapplied and you can tag another invoice to apply that 100. If this field is zero that means your received amount and applied amount are same. Issued By : This field will only appear when you select “Received Mode” as any bank name. Please enter the bank name from where your customer has issued this check. If you select “Received Mode” as cash this option will not appear on this screen. Check Date : This field will only appear when you select “Received Mode” as Bank. Please enter the date which is mentioned on the check. Check No. : Like Issued By and Check Date fields Check No filed will only appear if you select “Received Mode” as Bank. Please enter the check number here. Once you have entered the details then please select the invoice or multiple invoices against which you have received this payment and applying in system. You will have to select the invoice by clicking on the check box and entering the invoice amount manually (5000.00, 35000.00, 450000.00 etc) in “Payment Applied” field. Then click on Apply to process the transaction. This screen will only display all the outstanding invoice where they have any amount due. Once the invoice is fully paid, that will disappear from this screen. As soon as you click on Apply, system will generate one payment receipt no.